Long Beach Transit's water taxi service hours will be extended for July 4. Long Beach Transit photo. AquaBus, which takes customers along a circuit that stops at the Queen Mary, Hotel Maya, Shoreline Village and the Aquarium of the Pacific, will operate on its weekend schedule on the holiday, with service running until 7:30 p.m. The boat carries 35 passengers and fare is $1 each way. 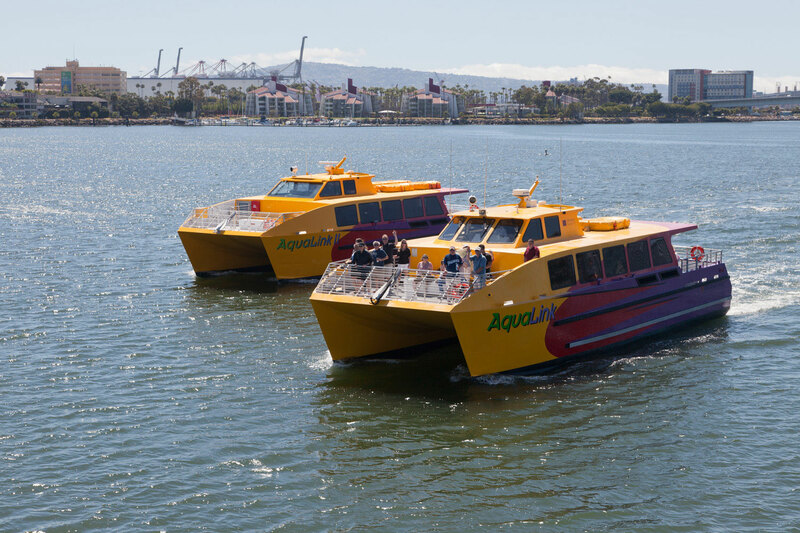 AquaLink, which carries up to 75 passengers, will serve Alamitos Bay, the Aquarium of the Pacific and the Queen Mary, will run until 10:30 p.m. Refreshments are available on the AquaLink and the fare is $5 each way. LBT will also offer Saturday bus schedules on the Fourth. For more information, go to www.lbtransit.com.